Reactions time. PSG, it is who we will face next week in the champions league and they seem to already try to get an advantage over Chlesea before playing. Jose stated today in the conference that a surprsing 300 million offer for Hazard and Oscar could tempt Chelsea to sell their two important attacking midfielders. Seeing them in a PSG shirt? NO, JUST NO!!! Here is some quote from the PSG players. “Oscar is a very good player,” said Moura. “A rare talent in today’s football, given his qualities. He is very complete and is very smart. We need someone like him at PSG.“I think he would help us a lot. The more quality players there are, the better it is for the squad. Also, he’s a very good friend of mine. I would be very happy if he came to PSG, the club too.” Seems more like a club who can buy players on and on cause of money. Jose isn’t known well for keeping key players. Mourinho agreed to sell Juan Mata to Manchester United in January after making it clear that Oscar is his first-choice number 10 and Hazard has been Chelsea’s best player this season but I am not the one to argue with The Special one’s tactics and choices. 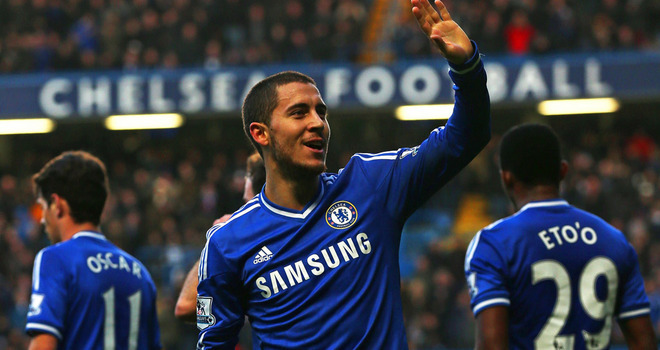 On Hazard, former Newcastle midfielder Cabaye said: “Hazard is the player I’d like to see at PSG. He would do a lot of good to Paris and the league. He’s one of the best players against whom I’ve played.” On the bright side, Chelsea are adamant that any bids for the duo, from PSG or anywhere else, will be rejected. Both players have three years remaining on their Stamford Bridge contracts, with the club willing to offer them extensions. This time I won’t even put up a poll to see who votes for them to go out. Am pretty sure no one will. They are great players and even if they’ll leave Chelsea for any other club that has to be Bayern, Real Madrid or Barcelona cause I don’t think they’ll reject interest from these top clubs particularly if the wages are High! For now let them remain Chelsea players doing what they know how to do best!!! Stay off PSG we are not selling unfortunately.